In my first experience getting hands-on with Ubisoft’s lineup at E3 2017, I was given the opportunity to play two of their flagship titles, both out later this year, out of the majority of their lineup. Foregoing the opportunity to try out Skull & Bones or Mario + Rabbids Kingdom Battle, I instead chose to spend my time with Assassin’s Creed: Origins and Far Cry 5. 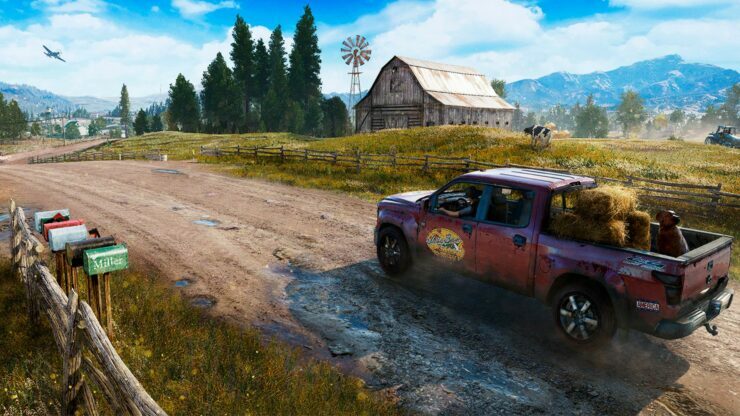 Both are fine open-world follow-ups to their respective franchises, but with it being a couple of years since I last played a Far Cry title, I was more excited to get my chance to visit Hope County. Immediately after picking up the PS4 controller and choosing my partner (a gun for hire), the demo threw me right into the action. Without even a chance to check my controls, I was already undertaking a liberation of a tiny town (barely more than a few buildings and a church) set in the Montana backdrop. But I didn’t need to. After all, this was a Far Cry title and those controls are instantly familiar, weapon radial menus and all. Of course, there wasn’t a dedicated middle-finger prompt like there was in Blood Dragon, but at least the option to pet your dog was there. 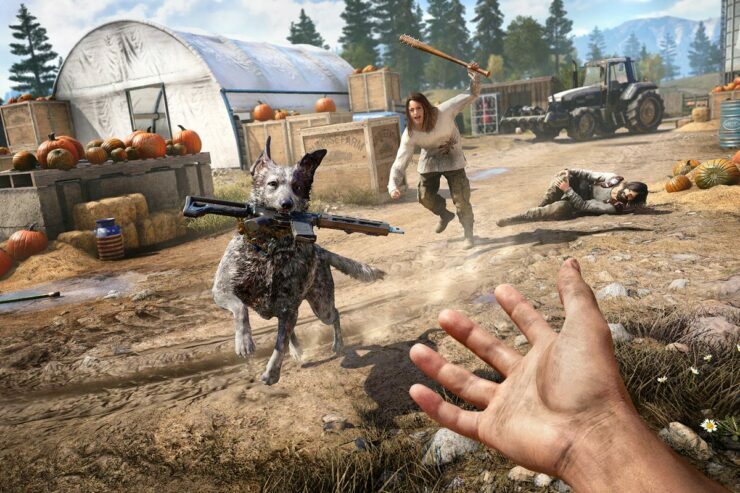 Being dropped right into the action is perhaps the best way to enjoy Far Cry 5; a baptism by gunfire, if you will. My chosen partner for the hands-on session was Boomer, a utility canine that can do more than just bark at enemies. Taking a few notes from D-Dog in the latest Metal Gear Solid, Boomer was able to mark enemies, retrieve weapons, and even assist in dispatching the local militia. Thanks to the magical power of dynamite, I was able to clear out the province with the greatest of ease (and the chain reaction of exploding vehicles always helps!). From there, I was off to go journey at my own discretion. The next side mission to tackle was with Nick Rye, the pilot that was one of the other two teammates that I didn’t choose to partner up with, out at his airfield. Getting there wasn’t as simple as just walking from one point to the next, so taking a car is obviously the best approach. I commandeered one of the militia’s few remaining vehicles not destroyed in the firefight and went off on my merry way. The gentleman guiding me through the demo pointed out a fishing hole on the way to the airfield and in hindsight, I should have taken the opportunity to indulge in a little side activity. But with time at a premium, I at least wanted to play through the next story mission before my appointment was up. Upon rolling up to the airfield, it was time for another obligatory firefight. After all, they weren’t going to just let me get on that airplane and take to the skies. I wasn’t doing nearly as well this second time around since I had used up most of my ammo and grenades in the last fight and forgot to pick up some off the numerous corpses scattered around town. Still, I did the best I could with a pistol until I could loot the bodies and find another assault rifle, albeit one that seemed less effective than my starting gear. Of course, that didn’t truly matter for very long because it was time to take the fight to the skies. Flying in a Far Cry game was always a bit of a rarity for me. With the exception of piloting the Buzzer in the last game (which is still the best vehicle in the game when you learn to drop grenades on people from above), I haven’t done much in terms of aerial combat. Despite that, piloting the small cropduster felt strange at first in Far Cry 5. Let’s just say it was a lot easier to control and make dexterous maneuvers than even Ace Combat 7, which I also had the privilege of getting hands-on with. Using only the left analog stick to control the plane felt disorienting at first, especially when I kept trying to use the right analog stick to control the pitch and yaw, only to instead make my character stare at the floor. However, it all sort of clicked after only a couple moments of awkward fumbling and I was able to continue on my mission of a brief aerial dogfight followed by some air-to-ground combat with taking out a few stationary targets. True to the type of authenticity that Ubisoft is trying to create with Far Cry 5, trying to fly by and perform a bombing run wasn’t as simple as just pushing a button and hoping for the best. I actually had to slow down the plane and either get much closer to the antenna I was tasked with destroying or get a proper lead and make a guess on the arc and trajectory. 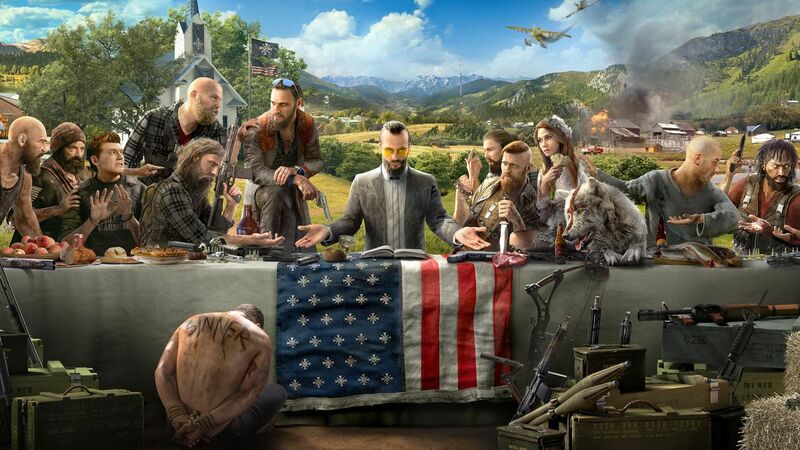 In total, I think my hands-on time with Far Cry 5 barely lasted half an hour, but it was enough time to test the waters and decide for myself if it’s time to jump into another open world shooter. It’s already been a couple of years since my journey into Kyrat and no other open world shooter since then has captured the same magic of gunplay the way a Far Cry title has. 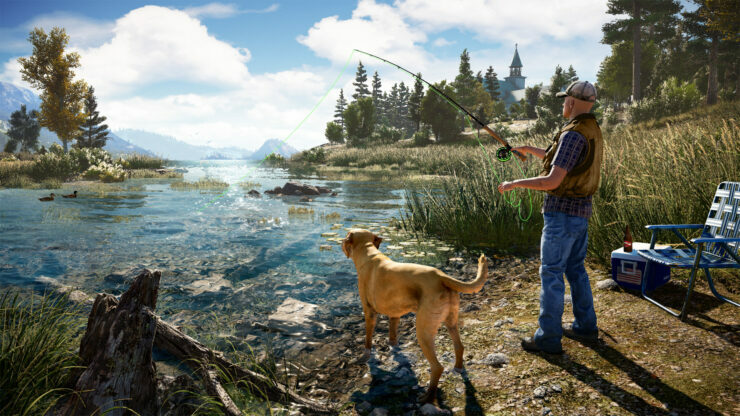 I might have to leave Boomer alone for a few months, but he and I are going to make such a good team when it comes time to liberate Hope County, Montana.